CHINESE NAME: Han Fang Ji. DISTRIBUTION AREA: The area of distribution of Stefania Tetrandra is the eastern part of the Eurasian continent. It grows in the Chinese provinces of Zhejiang, Anhui, Fujian, Hunan, Jiangxi, Guangdong, Hainan, Taiwan and Guangxi Zhuang Autonomous Region. BOTANICAL INFORMATION: Stephania Tetrandra is an herbaceous vine in Menispermaceae family. This plant is 1-3 m high with fleshy, cylindrical root. The foliage is dense. Leaves are narrow-thyroid, broad-triangular or triangular, pubescent (on both sides or only from the upper), acuminate. Flowers are dioecious, five-petalled, collected in the head inflorescence. There are four sepals (sometimes five), five petals, four stamens in male flowers. Fruit is a drupe; ripe fruit is of red color, almost spherical in shape. PART USED: The roots are cleaned from soil and sand, washed, if necessary, cut into small pieces and dried in the sun (or in special dryers). Store dried roots in an airtight container (plastic or glass) in a dark place. CHEMICAL COMPOSITION: The main biologically active substances of Stefania Tetrandra are two bis-benzylisoquinoline alkaloids: fanquinoline and tetrandrin. The roots and shoots of the plant contain the isoquinoline alkaloid d, dl-tetrandin. It enters such meridians as bladder, spleen, kidney. ACTIONS: analgesic, immunosuppressive, anti-pyretic, anti-arthritic, anti-inflammatory, diuretic, anti-dermatitis, anti-bacterial, anti-ulcer, anti-tumor, anti-diabetic, anti-allergic, anti-asthmatic, cardio-tonic, anti-arrhythmic, anti-cancer, protective, anti-rheumatic. Stephania Tetrandra clears heat and dispels blood stasis, stops cough, protects from pathogen harm, expels phlegm, inhibits the growth of cancer cells, reduces edema mostly in the lower body, strengthens kidney function, dispels wind and dampness in order to alleviate pain and increase urine production, regulates the water passages. Stephania Tetrandra is a good remedy for ascites, phlegm, buccal mucosal pain, dysuria, painful contractions of the hands and feet, edema, gurgling intestines, inhibited urination, hand pain, scanty menses, knee arthritis, cardiac arrhythmia, high blood pressure, neuralgia, eczema, painful joints, borborygmus, beriberi, abdominal diseases, arrhythmia, rheumatism, sore throat, allergy, autoimmune diseases, boils, hypertension, bloating, kidney failure, cancer. 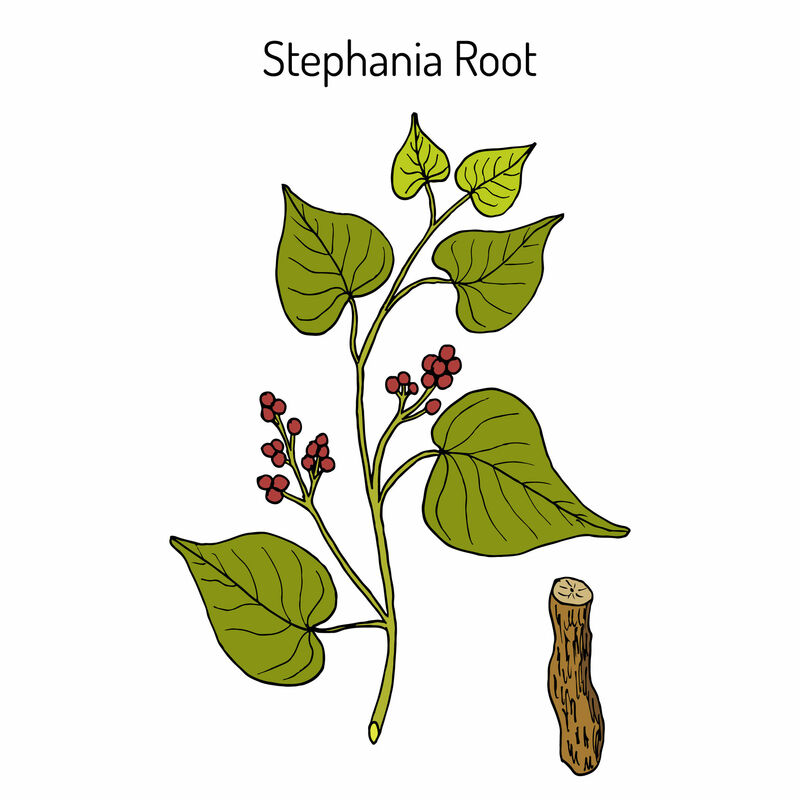 Stephania Tetrandra is forbidden during pregnancy and breast-feeding, when having loss of appetite, spleen and stomach deficiency due to cold, blood deficiency before or after parturition. Be careful using this herb when having spleen and stomach deficiencies, and yin deficiency. Overdosing can cause vomiting, ataxia, tremor, convulsions, Kearns Sayre Syndrome (KKS), quadriplegia, respiratory failure, hypertonicity. Do not take this herb together with diuretic medications. It can readily injure the stomach.